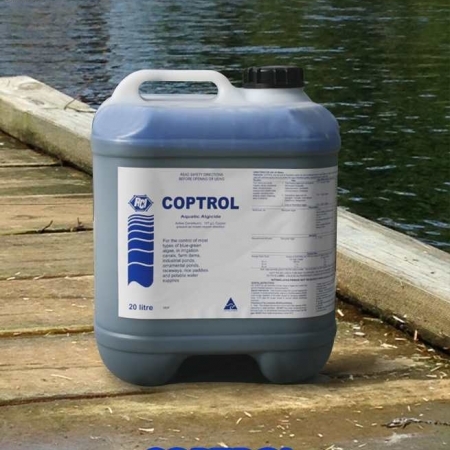 Coptrol stops algae growth such as free floating and filamentous green algae, green slime algae and brown algae and will not harm livestock, birds, fish, pets or people drinking the water if used in accordance with the label directions. 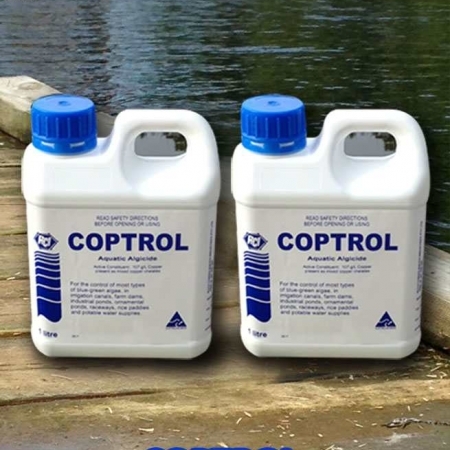 Coptrol is a commercial grade algaecide, used for the safe and effective control of algae & algal blooms. 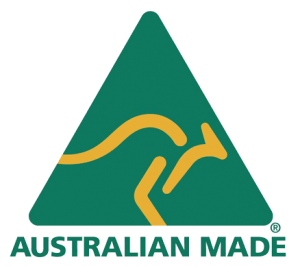 Coptrol is approved by the Australian Pesticides and Veterinary Medicines Authority (APVMA), the National Registration Authority for agricultural and veterinary chemicals. 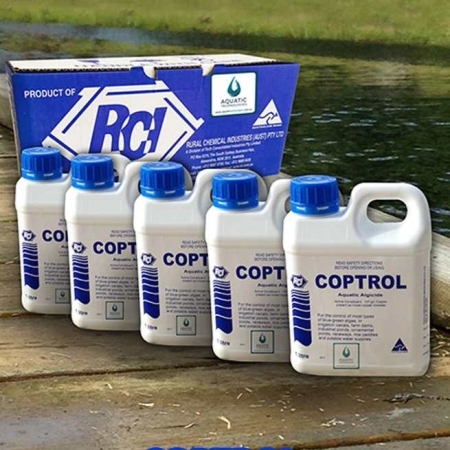 Coptrol is widely used to kill off algae in dam water, green algae growing in ponds or algae present in irrigation water and will not harm fish, livestock, plants, pastures or turf (when used in accordance with label instructions). Coptrol, used for the control of algae is a new generation algaecide that is safe enough for use in potable water (drinking water). 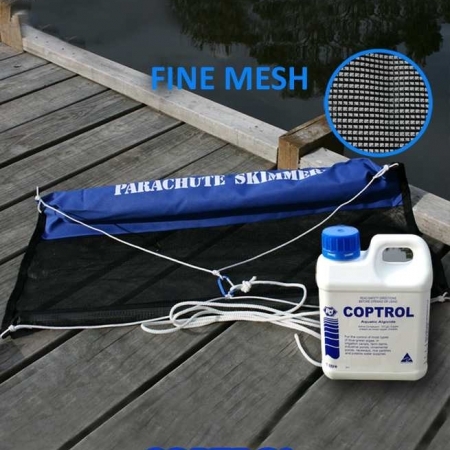 For safety FAQ’s using Coptrol as an algae retardant, please view our ‘Safety‘ page. Help, I have algae growing in my dam! 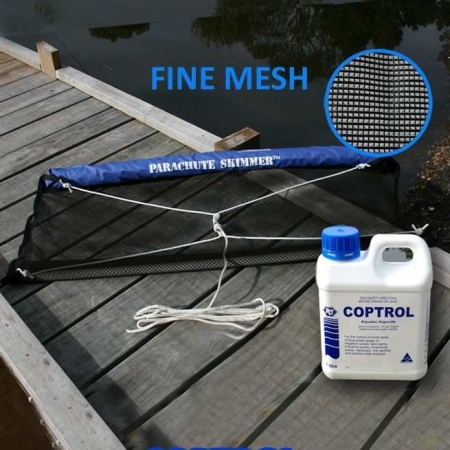 Coptrol is an environmentally friendly algaecide, that will get rid of existing algae and prevent any new algae from growing. 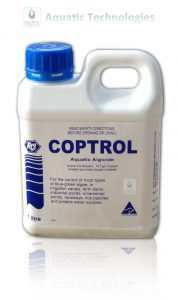 Stop algae growth with Coptrol algaecide. Algae are generally microscopic organisms and usually thought of as simple aquatic plants which do not have roots, stems or leaves and have primitive methods of reproduction. They are carbon fixing and oxygenating organisms. However, some algae display primitive animal features such as motility, while blue-green algae differ markedly from plants and all other algae, in that they have a cellular structure and function that is more common to bacteria than to the plant kingdom. Algae live in a wide range of aquatic environments and are a natural component of most aquatic ecosystems. Additionally, a great many are also terrestrial, living in soil, snow or in association with other organisms, especially fungi (as lichens) and animals. Aquatic algae are found in both fresh and marine waters. They range in size from large kelp (metres in length) to those visible only under a microscope. Algae, while looking unsightly, can trap litter & sediment, reduce the holding capacity of a dam or cause smells and scum whilst decaying. Algal blooms may deplete oxygen concentrations in water which can smother fish, animals or plant life. Floating algal masses can asphyxiate rice crops and prevent young plants from emerging. In certain conditions, cyanobacteria may form dense blooms, which may produce toxins that make seafood poisonous to humans. Even if the cyanobacteria do not produce toxins, blooms can cause water to have an unpleasant taste and odour. 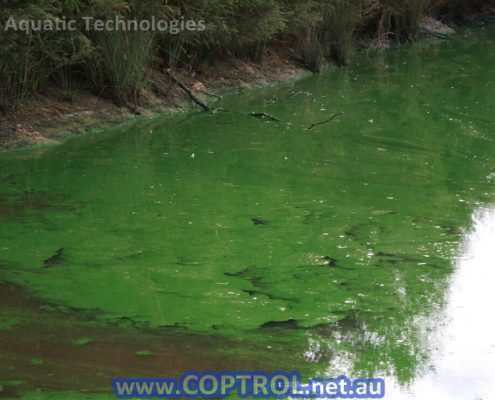 Algae has been known to block pipes, siphon tubes, irrigation channels and pumps, severely impeding water flow. Certain blue-green algal blooms are toxic and can cause a rash known as swimmer’s itch, while powerful neuromuscular toxins released by other cyanobacteria can kill fish living in the water or the animals that drink it. In certain conditions, cyanobacteria may form dense blooms, which may produce toxins that make seafood poisonous to humans. Even if the cyanobacteria do not produce toxins, blooms can cause water to have an unpleasant taste and odour. 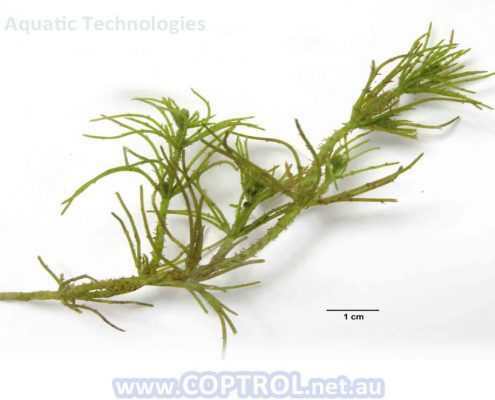 This type of algae is normally treated with between 0.2-0.5 mg/L of Coptrol. If heavily infested, re-treat after 10-14 days. 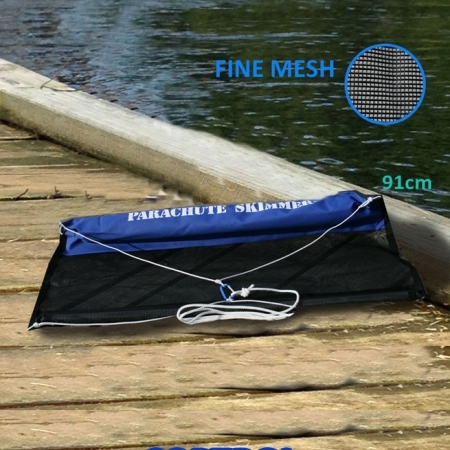 Micro algae can contain toxins such as in Blue Green Algae. Micro algae looks like a green oil slick or paint on the water’s surface and tends to congregate in downwind edges of dams and lakes. 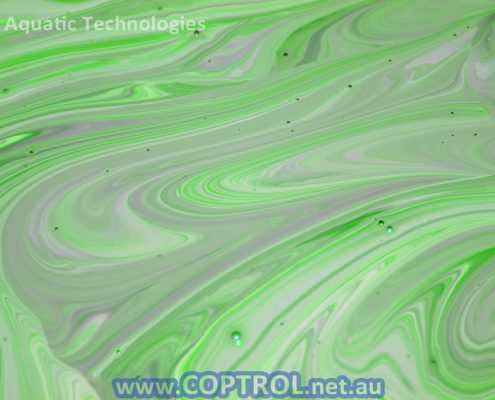 This form of algae can be toxic to humans, domestic or native animals and birds. It is of most concern when people are in contact with water contaminated with toxic Blue Green Algae, if it is used for irrigation and staff are handling the water it can pose an OH&S risk. 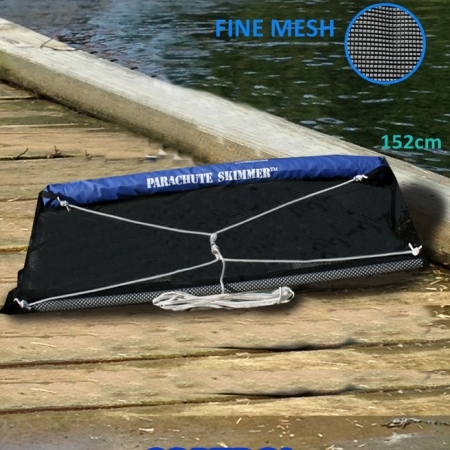 If the public has access to the water, it can be a duty of care risk. 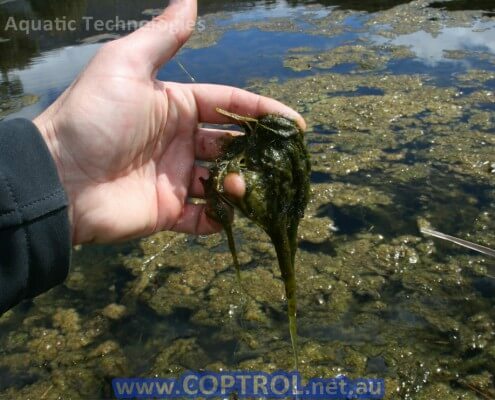 This type of algae is normally treated with between 0.5-1 mg/L of Coptrol. If heavily infested, re-treat after 10-14 days. Plant Structured Algae is algae that takes a similar form and shape to aquatic plants. 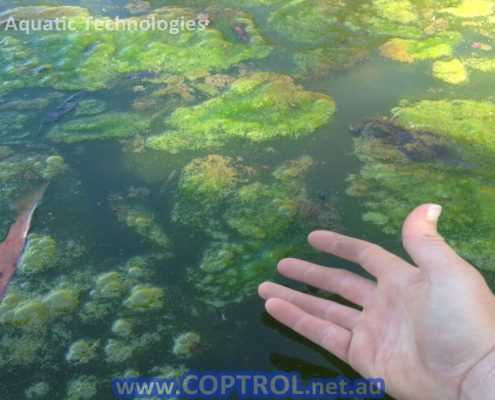 This type of algae can cause strong odours and bad tasting water. 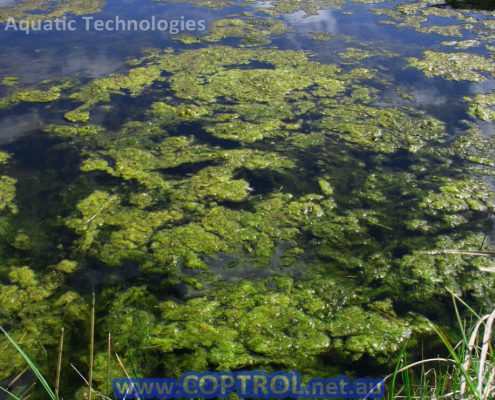 Coptrol can be used wherever algae pose a risk, problem or cause a nuisance. 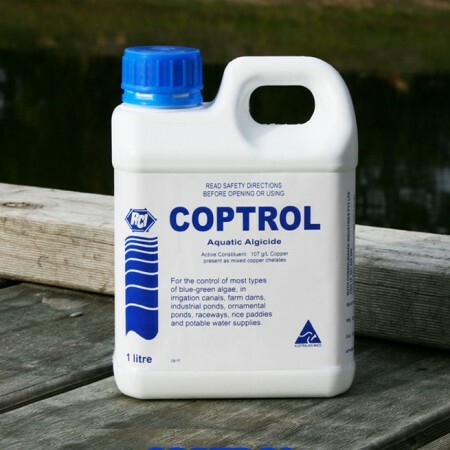 Coptrol is approved for use in potable water supplies (water supplies & tanks suitable for drinking) by the APVMA (Australian Pesticides& Veterinary Medicines Authority – reg no. 31030) to treat algae. 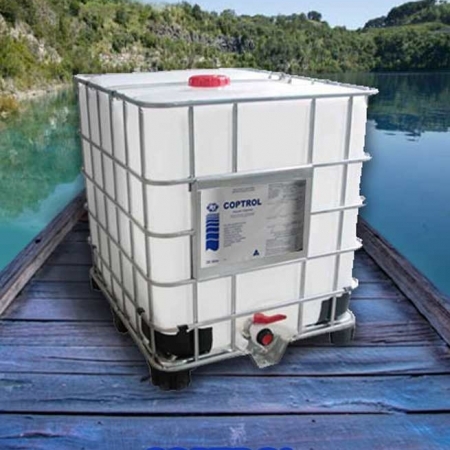 Coptrol can be used in water supplies used for cattle & livestock watering. Coptrol will not harm livestock, birds, fish or domestic pets when used in accordance with the label directions. 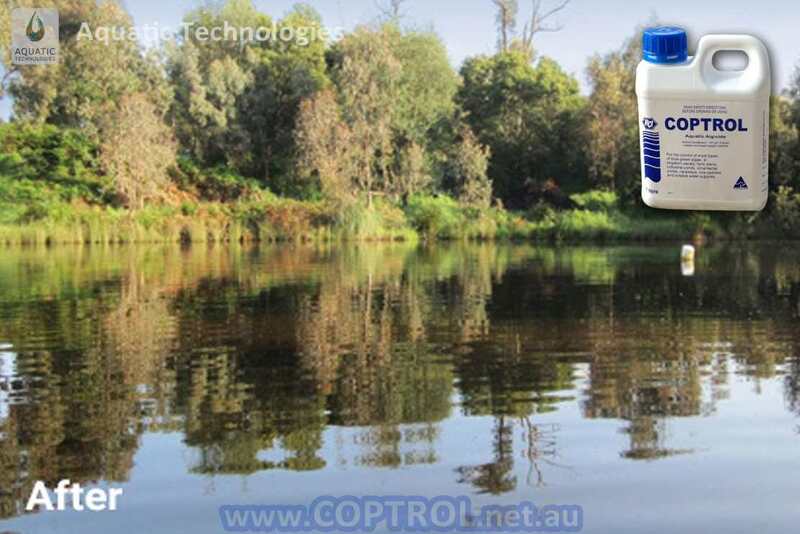 Coptrol can be used in water supplies used for irrigation. It will not harm flood irrigated rice fields, crops, hydroponic plants, turf, pastures or plants. There is no withholding period after a Coptrol application when used as directed. 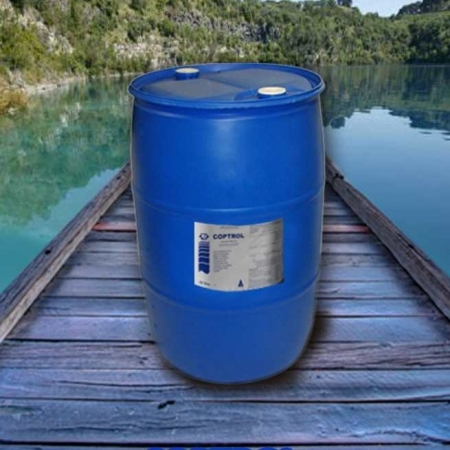 Coptrol is a noncorrosive viscous liquid that will not corrode metal pumps, fountains or irrigation equipment. 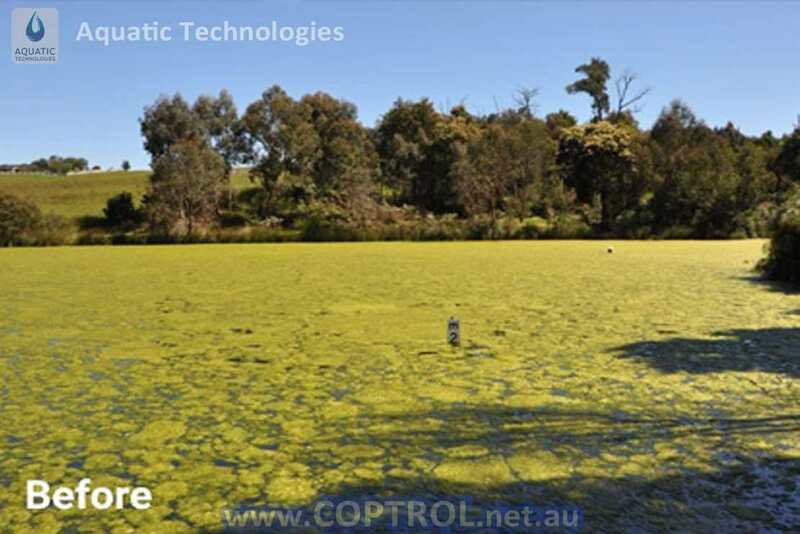 Coptrol offers a new approach to the control of an algal bloom (free floating or filamentous) in potable water supplies, animal drinking troughs, aquaculture, farm dams/ponds, flood irrigation bays, fountains, gardens, golf courses, hydroponics, irrigation channels, lakes, mining, microspray & drip irrigation, nurseries, ornamental fish ponds, poultry shedding, power stations, reservoirs, rice crops, sewage treatment, turf farms, waste water, water cooling towers, waterways, irrigation canals & other aquatic environments. DIY or Book in a Service Call.